Phone Manager Plus Caller ID by KJB Security at Pear Farm. MPN: V1170. Hurry! Limited time offer. Offer valid only while supplies last. Incoming Calls: Identifies the source of incoming calls by displaying the number of the call. Also, provides time and duration of phone calls. Incoming Calls: Identifies the source of incoming calls by displaying the number of the call. 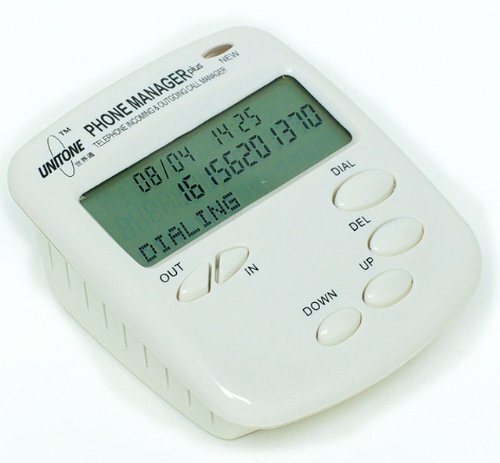 Also, provides time and duration of phone calls. Outgoing Calls: Identifies the source of outgoing calls by displaying the number of the call. Also, provides time and duration of phone calls. Small Convenient Size: Easy to pack in your luggage while traveling. Monitors calls on any analog line. Low power Consumption : Typical battery life is approximately 3 months Large Memory Capacity: Can record data on up to 2000 incoming and outgoing phone calls Easy To Use: Clearly labeled and easy to understand function keys. View More In Caller ID Displays. If you have any questions about this product by KJB Security, contact us by completing and submitting the form below. If you are looking for a specif part number, please include it with your message.